Sometimes, even an indecisive stance can be wrong. When it comes to the international intervention in Libya, until recent days, I was indecisive, and I was wrong. A couple of days ago, I got off that fence, and actually came down on the side I had been leaning away from (as evidenced by a short quip in this article I recently wrote). Before I could post anything on that subject, Juan Cole posted an outstanding argument supporting the current international intervention. You should read it. As always, my own thoughts are a little different, but I find nothing in Cole’s piece to disagree with. My initial ambivalence was based on a number of factors. It was certainly clear enough to me that Qaddafi was preparing to seriously escalate his assault on the rebellious citizens in Libya, and there was every reason to believe that the casualty rate would be high and would include a good many uninvolved bystanders as well as the rebels. But when the no-fly zone was first announced, it looked an awful lot like another American intervention without a clear exit strategy. I was concerned that the US was once again heading into a Muslim country without thinking through long-term considerations. Moreover, I was not only mistrustful of any international effort led by the US, UK and France, but was especially worried because it meant a Western military presence right next door to Tunisia and Egypt, and a greater concentration of Western forces in general near the sites of other potential revolutions. I still have those concerns, and I think they’re healthy. Given the history of the three countries leading this effort, we should remain ever vigilant. But in the end, none of this stacks up against what it was apparent Qaddafi was about to do. And there are more considerations here. As Cole points out, the comparisons to the Iraq invasion are inappropriate. 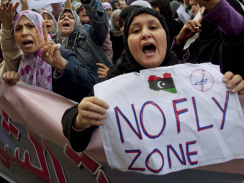 Indeed, if we believe in international law, the Libya no-fly zone was a prime example of how it is supposed to work. Above all, the point of international law is to prevent atrocities. And, in stark contrast to Iraq, the US worked through the Security Council, acted on a resolution from it, and did it all in response to a call for intervention from the Arab League. That is the way these things are supposed to work, and the resolution from the UNSC is limited in its scope. There is still reason for concern, given who is leading the effort. President Obama does not have a stellar track record of thinking through military and international strategies; Nicolas Sarkozy is hardly someone trusted with a progressive agenda; and David Cameron’s self-identification as a “compassionate conservative” draws uncomfortable echoes of George W. Bush. There’s every reason to keep a keen eye on these guys. But the US remains the key in such matters, and Obama is clearly loathe to get involved in a new military misadventure in the Middle East. Given that his own advisors were split as to whether or not the US should even go this far, Obama has some significant brakes against over-involvement in Libya. The history of American foreign intervention is not all to one side or another. Most would agree that FDR’s maneuvering to get into World War II was a good idea. Many would argue (myself included) that, though difficult, the same was true in Bosnia. The counter-examples are obvious – Vietnam, Iraq, Afghanistan and one that is less often mentioned these days, Somalia, among far too many others. The results of foreign inaction are also notable, in Rwanda and Sudan in recent years, and Cambodia years ago, again among others. I don’t think we can approach foreign intervention with a blanket attitude, especially intervention that is authorized by the Security Council. When it is done through proper international channels and has wide international support, we should be inclined to look at it more favorably. I can understand why we don’t. At first, in this case, I didn’t. The ugly history of European colonialism and, more recently Soviet and then just American global “pursuit of interests” or “spheres of influence” make us dubious, to say the least. But I also don’t want to live in a world where we stand idly by while atrocities are committed, and the fact that those atrocities might be entirely confined within a country’s borders is hardly a reason (as some argue it is) to refrain from intervention. We have to be able to look at each case individually. And, no, if you’re wondering, I do not favor similar intervention despite obvious government crimes in places like Bahrain and, absolutely, Syria. Not only was the scale of possible atrocities much greater in Libya, but the prospect for useful intervention that did not include ground troops, was also much greater in Libya. It is also possible that President Obama can use Libya as a renewed model for international intervention, one which would not only take back intervention from the neoconservatives who wished to use it to destroy the international order and firmly entrench the USA as the world’s supreme authority, but can also demonstrate to the people throughout the Middle East that we don’t take Arab or Muslim lives for granted and that we do have the potential to play a positive and helpful role in the region. After all the decades of amazingly destructive US policy in the Middle East, we can certainly use that. Of course, no one will buy a positive view of the US for long while we obstinately support Israeli human rights violations in the Gaza Strip especially, and settlement expansion in Jerusalem and the greater West Bank. But that’s a different matter, and it should not prevent us from supporting constructive US action in the region where we can. Libya may end up representing an opportunity for Obama to finally start fulfilling the promises he made early on, that he would clean up the mess left by the Bush-Cheney neocons. It’s an effort worth supporting, and I’m sorry it took me this long to realize that.